Tuscany Tech Case & Charging Accessories Tech Case. Includes the Tuscanyâ„¢ Tech Case with the Econo Mobile Charger, the AC Mobile Charger and the Rocket Dual USB Car Charger. Case is soft faux leather over rigid EVA plastic shell with two internal elastic mesh pockets, large pocket with Velcro closure and zippered closure. Battery is a portable Samsung Lithium-ion cell in ABS plastic shell allows you to charge your devices virtually anywhere. Power bank includes standard USB connector cable to charge battery from your Computer or any USB port with a power supply. Input: 5V DC; Capacity: 2200mAh; Output: 1000mA. Lifespan: Up to 500 charges. Charging capacity: 100% for iPhoneÂ® & Smartphones; iPadÂ®: 15% for iPadÂ® 1, 2 and 3 - 20% for iPadÂ® Mini; 100% for iPodÂ® and Digital Music Players. CE and FCC approved. AC Charger is ABS plastic and plugs into a standard wall outlet and charge your mobile devices through a standard USB port. Plug prongs swivel into body of unit. Input: AC 100-240V, 0.07A 50-60Hz; Output: DC 5.0V, 1000mA. ULÂ® approved. Car charger allows you to charge your devices on the go! This ABS plastic charger has dual ports and an LED light. Input: DC12V-24V. Output: DC 5.0V-1-2.1A. 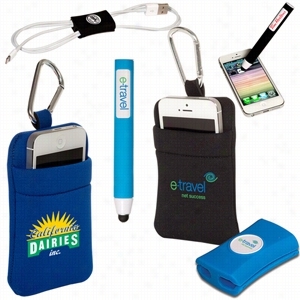 Combines the Commuter USB Car Charger with the GumbiteÂ® Dolli Mobile Phone Holder in the Accessory Pouch â€“ Neoprene. The Commuter USB Car Charger lets you charge your devices on the go! This charger has dual ports and a LED ring that helps illuminate the logo area in the dark. Input: DC12V-24V; Output: DC 5.0V-1000mA, 2.1-1A; Compatible with all USB charging cables including mobile phones, MP3, MP4, iPodÂ®, iPhoneÂ®, iPadÂ®,GPS, digital camera, etc. The GumbiteÂ® Dolli Mobile Phone Holder is an ABS plastic holder with polyurethane suction cups that securely mounts your mobile device virtually anywhere. The rotating ball-joint is designed for omni-directional placement. Works best on glass and polished surfaces. 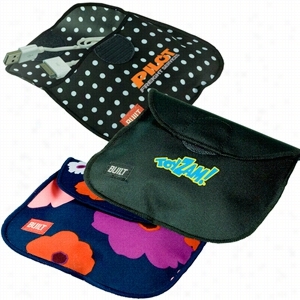 The Accessory Pouch â€“ Neoprene features a zippered closure, carabiner, and fits a variety of devices including the new iPadÂ® Mini and KindleÂ® Fire. Combines the GumbiteÂ® Snappi Cable Organizer and the GumbiteÂ® Styli for Touchscreen Mobile Devices in the Neoprene Phone Holder. The GumbiteÂ® Snappi Cable Organizer is made from silicone and eliminates annoying tangled cables allowing you to manage your Computer cables at home, in the office or on the road. The GumbiteÂ® Styli for Touchscreen Mobile Devices is a silicone-coated stylus for use with an iPadÂ® or any other touchscreen device and features a broad design that offers comfort as well as accurate control. The Neoprene Phone Holder includes carabiner clip. Durable polyester Bag ideal for travel accessories or toiletries VelcroÂ® closure secures contents in bag Wipes clean and dishwasher safe PVC- BPA- latex- and vinyl-free Tested for lead safety and phthalates. Large Polka Dot Accessories Box. Absolute style and organization, this accessories box makes the perfect Gift. 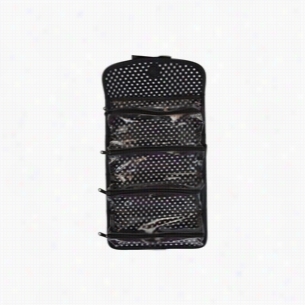 Interior features 4 clear zippered pockets for storing makeup, jewelry, etc. Front features ribbon detail and Velcro closure. Materials: Microfiber. 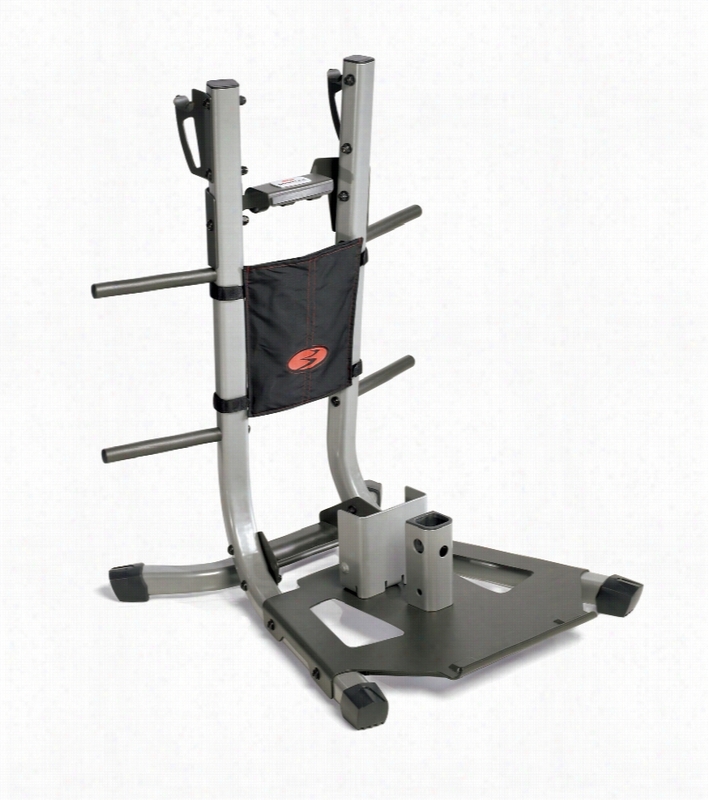 This rack, specially designed to work with the Bowflex Revolution&#174; home gym, stores your accessories and attachments between workouts to help keep your workout area organized. Combines the Logo-Bloxâ„¢ Phone Stand with the Logo-Bloxâ„¢ Stylus and the Logo-Bloxâ„¢ Screen Cleaner. All items are ABS plastic with Logo-Bloxâ„¢ design. 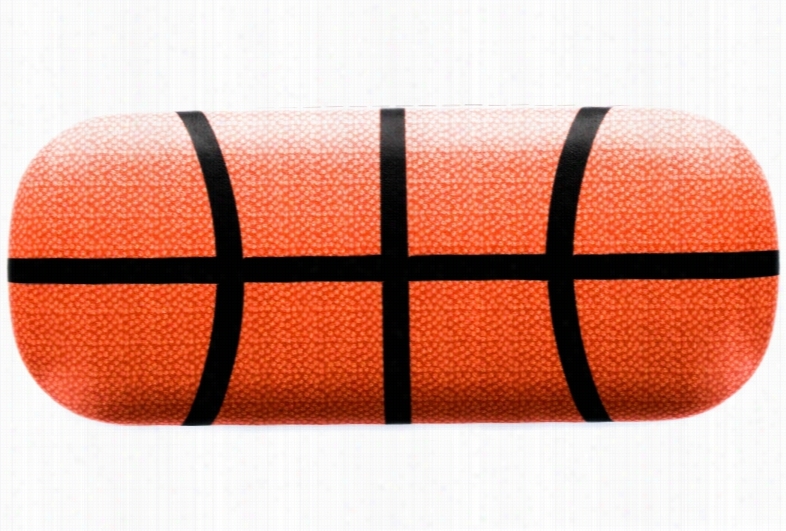 Stylus features soft silicone tip. Screen cleaner features faux suede cleaner to remove dust and fingerprints from device screens. 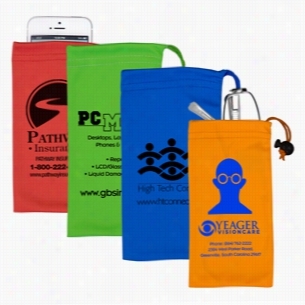 Spot Color Microfiber Drawstring Pouch For Cell Phones,Eyeglasses And Other Accessories. 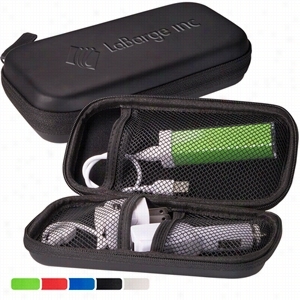 These 100% microfiber pouch are made with high-density microfiber materials. 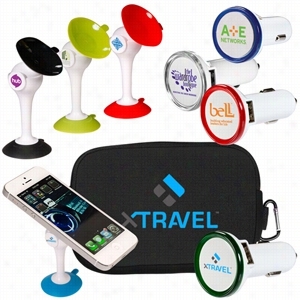 Carry your smartphones, ipod, camera, Glasses and more. Designed to remove dirt, dust, and oily smudges from sensitive surfaces without scratching. 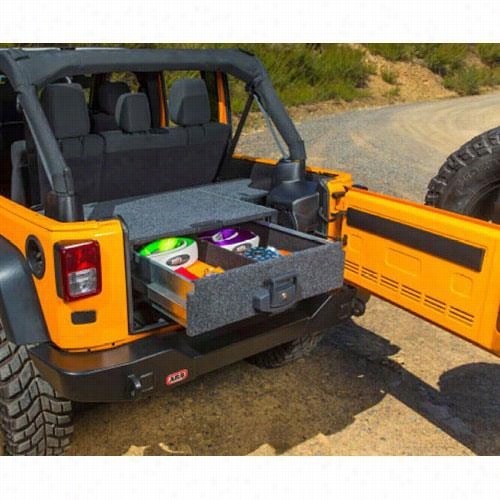 ARB 4x4 Accessories Outback Solutions Modular Roller Drawer System with Plastic Trim and Inegrated Subwoofer 5012010 Cargo Drawer. The California Accessories Children's Sport Eyeglass Case is a fun and functional way for children to keep their glasses safe. Whether they're trying to bend it like Beckham or aspiring to hit the shot heard 'round the world, the choice is theirs. Hard exterior, soft interior Ball pattern Designed for children's eyewear.